Kantary Cafe Cafe Kantary recommend famed desserts, good luck, "the kung fu Strawberry Tree" with soft tongue. Filled with Strawberry Tree. Young, sweet and sour clashed with sweet red bean paste. Perfect for a snack and refreshment. Or give as gifts to wish you good luck. 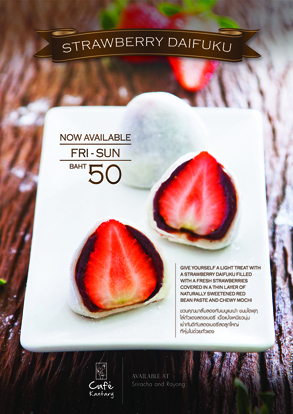 Try the Kung Fu Strawberry Bakery Café Rayong and Sriracha Kantary only on Friday - Sunday. Only the 50 THB. Kulisara Udorn (Udon's own list). PR Executive, Cape & Kantary Hotels.